GO! Canada News (Winnipeg MB), 31 August 2014. 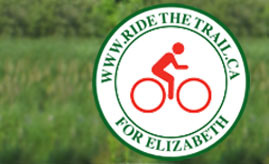 Edmund Aunger's cross-country ride along the Trans Canada Trail began on July 1, 2013, in Victoria, British Columbia, and will finish on July 14, 2017 - the fifth anniversary of his wife's death - in Hunter River, Prince Edward Island. By Norm Grywinski.